The Regulatory Framework of UAV Flying in Canada? A concise picture of the Canadian Aviation Regulations and the Aeronautics Act for UAV operators. The training is completely taught by an instructor and covers the flight rules, airspace and flight plans with practical examples. You will quickly learn to navigate Transport Canada’s website. You will be led through all the steps of planning a remotely piloted flight, including predicting winds in a risk matrix. You will learn the official rules of flight in immersion (FPV) and the current situation in insurance and responsibility of pilots of model aircraft (recreation) and UAV (work). The 2.5 hours of instruction pass quickly and enjoyably. It is the greatest source of information available in Canada for recreational pilots of remotely piloted aircraft, all from the comfort of your own home! This short online course being a familiarization to the regulatory framework in Canada, doesn’t meet the TP15263 requirements for professional UAV pilots. Total time estimated: 2 hours 30 minutes. Study at your pace, your access lasts 60 days. Course available in English or French. 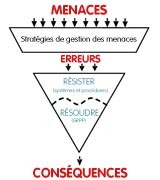 Threat and Error Management introduces the concept of “Threats”, those things that are the precursors to errors that may decrease safety margins in aviation. The TEM system uses established behavioural markers that will assist in creating “Strategies” that will prevent threats from leading to errors and negative consequences. The course provides an applied, practical approach to explaining TEM principles. Threat and error management is an invaluable tool in professional UAV operations creation and compliments any effort to identify hazards in any operation. Other Human Factors models are also studied in this course and used in real-life UAV accident analysis. Candidates are guided in three analysis processes of the same scenarios and discover valuable lessons.This online TEM training uses tutorials, a quiz and an exam to complement the Light UAV Professional Pilot Course offered by the CQFA, at no additional cost. The accidents presented in the course happened for real. It takes 2 hours to complete and presents the origins of TEM and offers the knowledge to implement TEM in your daily UAV operations.